All rooms have private ensuite bathrooms, cable TV, WiFi, fridges, fireplaces & incredible views at this adult oriented 1902 historic b & b located in a quiet park right in Moose Jaw. A scrumptious breakfast greets you each morning. Relax in your comfy king heart shaped bed or single day bed. This large romantic second floor suite is decorated in navy blue and white. This third floor loft suite is adorned in rose and jade colors. A garden setting sets the scene for elegant whirlpool romance in this suite's tribute to green. This cozy room, with electric fireplace, offers direct access to the wrap around balcony. Unwind on a queen size bed in this second floor room with a French country feel and a great view. Your breakfast, which is varied from day to day, will always be a healthy mixture of fresh fruit, home made baked goods and a hot entrée. This inn has been annually inspected and approved for your safety. Innkeepers have Serv-Safe Food Handler Certificate. All breakfasts are made especially for you by your innkeepers. It's a nice drive through Wakamow Valley park before you find us up on the hill overlooking the park. 1(866) 693-9963 or email us. Moose Jaw is has quickly become a hot tourist destination and for good reason. There is a lot to see and do. 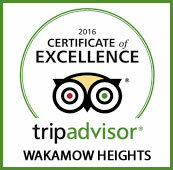 A gift certificate to Wakamow Heights Bed & Breakfast is the perfect gift to show your appreciation. A former Prime Minister of Canada was a guest in this house. The desire to share this fabulous house with guests and visitors is what led us to the world of innkeeping. We look forward to welcoming you to our historic 1902 built home and the City of Moose Jaw.